After spending the day in Sequoia National Park we drove to Oakhurst to spend the evening. It was a really nice place to wake up to. I took Buddy out for his morning walk, then after bringing him back to the room, I went for another walk with my camera. After a small breakfast we headed up Highway 41 to Yosemite. I can not believe I had never been before. The one thing I noticed was that the views looked almost fake because they were so beautiful. It was like a pull down backdrop for a family portrait or something. Paintings and photos that I thought had been exaggerated turned out to be as amazing as portrayed. If you ever have the opportunity, take a drive through it. Tanya and I did not have anything to do last night. I told her I had no objection to just jumping in the car and taking off. She suggested that what I was really saying is that I wanted to go for a ride. Since she was game, I asked Buddy if he wanted to go. He made it pretty clear he was up for it. 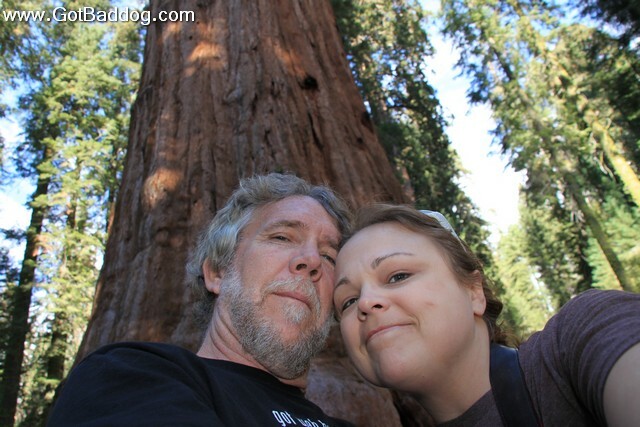 My photo of the day for day 288 if on Tanya and I in front of a huge tree in Sequoia National Park.